Demon bikers meet the Amish in the continuing adventures of Ichabod Crane. Ichabod Crane is finally getting used to life in modern-day Sleepy Hollow, and with the tragic loss of his wife and son, he now has no ties to his past. 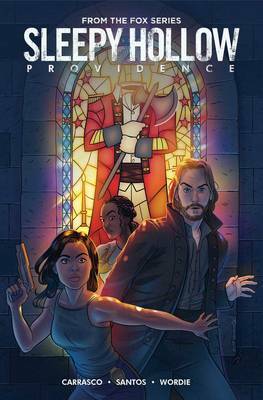 But when Jenny, a treasure hunter, uncovers a legendary artifact tied to a mysterious Amish girl and a band of vicious demon bikers, Ichabod, Jenny, and Abbie Mills will need all the power the old ways can provide . . . because it's time for a road trip to Amish country. Written by Eric Carrasco and illustrated by Victor Santos (Big Trouble in Little China), this self-contained miniseries bridges seasons 2 and 3 of the hit 20th Century Fox television series.